Nothing to do Friday night? Dress Up for Downs has you covered. 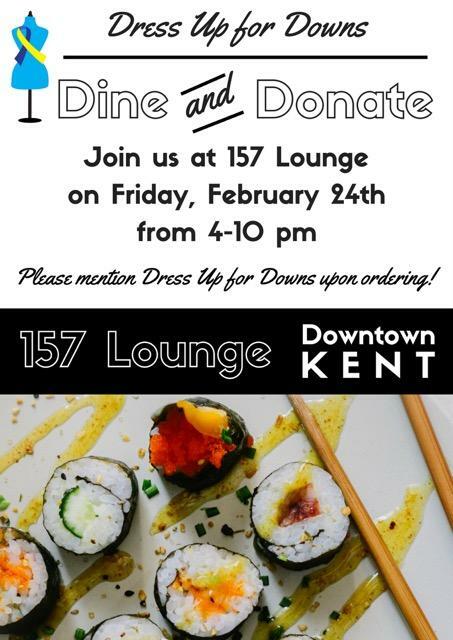 Join student organization Dress Up for Downs at their Dine and Donate event at 157 Lounge on Feb. 24. The event is a fundraiser for their annual fashion show held in the fall. The fashion show features models with Down syndrome modeling clothing specifically made for their body type. According to marketing coordinator Lexi Stoicovy, Dress Up For Downs is a student organization that advocates for individuals with Down syndrome and helps create opportunities for them on campus. Dine and Donate will run from 4 p.m. to 10 p.m. Make sure to mention Dress Up For Downs when ordering your meal.